BRUSSELS, Feb 16 (AFP)-The European Union has agreed the immediate launch of tests for horse DNA in meat products, seeking to reassure nervous consumers that their food is safe and to end the horsemeat scandal spreading across Europe. 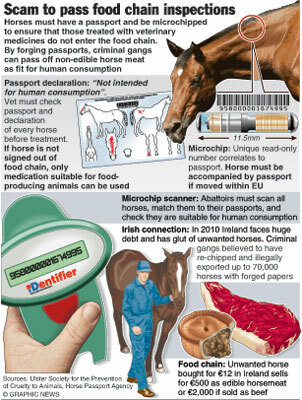 The test programme will also look for the presence of phenylbutazone, an anti-inflammatory treatment for horses which is harmful to humans and by law supposed to be kept out of the food chain.The crisis continued to build Friday as Austria and Norway confirmed that ready-to-eat “beef” meals containing horsemeat had been found, stoking concerns many more cases in more countries will come to light after falsely-labelled meat was found in Britain, France, Germany and Switzerland. The scandal has left governments scrambling to figure out how and where the mislabelling happened in the sprawling chain of production spanning a maze of abattoirs and meat suppliers across Europe. In Britain, the Food Standards Agency said that 29 out of 2,501 beef products it has tested so far have been found to contain more than one percent horsemeat but stressed that these must be considered exceptions. “The overwhelming majority of beef products in this country do not contain horse. The examples we have had are totally unacceptable but they are the exceptions,” FSA chief executive Catherine Brown said.